We recently obtained funding to extend work that we have been undertaking in Oxford over the last 5 years into the Palaeolithic chronology of Britain. We have been using ultrafiltration methods to date and, in some cases, redate, samples of bone from a number of sites dating to the Middle and Upper Palaeolithic. The results have modified our understanding of the presence of humans and their disappearance from the British Isles during periods of climatic deterioration. This project extends the work to continental Europe. Funding has been obtained from the Natural Environment Research Council (NERC) for three years from October 2006. The project is led by Tom Higham and includes a team of archaeologists, dating specialists and two doctoral students (see below). The displacement of Neanderthal populations by anatomically modern humans (AMH) in Europe between c. 45 and 30 ka BP is one of the most studied and debated transformations in human prehistory. Changes in human behaviour, cognition and innovation become evident across Europe in the archaeological record, based upon the increasing prevalence of symbolic art and portable artefacts of advanced technical skill, compared with what had been present previously. There is sharp debate over whether this technological and behavioural revolution represents the arrival and spread across Europe of AMH, derived ultimately from African or Asian origins, or whether it is partially an in situ or local development, representing a burgeoning level of complexity amongst Neanderthal populations already based in Europe. One thing is clear, the European record is the clearest evidence of the replacement of one species by another, but major problems remain in effectively elucidating how and where this process occurred and over what time period. To establish a reliable chronology for a selection of key Mid-Upper Palaeolithic sites in western Europe (including France, Germany, Spain and Britain) which contain identifiable remains of AMH/Neanderthals and/or organic artefacts of diagnostic Aurignacian type, such as osseous bone points and ornaments. We will radiocarbon date these samples using ultrafiltration AMS in Oxford. To investigate the question of the co-existence of Neanderthals and anatomically modern humans in western Europe, again using refined chronometric methods. A selection of key sites in western and central Europe that assume importance in this debate will be dated (or redated), notably the Chatelperronian levels of the Grotte du Renne at Arcy-sur-Cure, France. To utilise spatio-temporal statistical methodologies in tandem with developing calibration datasets to examine the dispersal of Aurignacian/AMH populations and test the various models proposed to account for the process of dispersal and the spread of key diagnostic artefacts across Europe. To contribute to the ongoing efforts to develop databases of reliable and unreliable radiocarbon measurements relating to the Middle and Upper Palaeolithic of Europe. This will also enable the dissemination of results and allow the data produced to be widely used by the research community. To apply and extend the methods of assessing bone gelatin quality and the procedures currently used in the extraction of undegraded gelatin from archaeological bones for AMS radiocarbon dating. For more information on the project and for publications stemming from it, contact Tom Higham (thomas.higham@rlaha.ox.ac.uk). Looking down on the human maxilla from Kent's Cavern, Torquay. The site is one of the most important Palaeolithic sites in Britain. This is the oldest human fossil from southwestern England, and was excavated in March, 1927. In 1988, it was radiocarbon dated to 30,900 ± 900 BP. The specimen is so fragmentary that it is uncertain whether the human represented possessed an anatomically modern morphology, or was a Neanderthal. (This problem may be resolved by an analysis of the DNA signature of the specimen which we are currently working on). 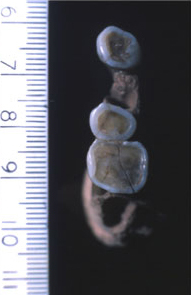 Questions also arise regarding the reliability of the AMS date because the maxilla had been treated with thin water-soluble glue. Further AMS dates obtained within the last two years from material found above and below the maxilla show that its real age is between 35-37 ka BP. Dr Tom Higham (Principal Investigator) : Deputy Director, Oxford Radiocarbon Accelerator Unit. Dr Roger Jacobi (Archaeologist) : The British Museum, London. Professor Christopher Ramsey (Co-investigator) : Director, Oxford Radiocarbon Accelerator Unit. Dr Laura Basell (Post doctoral researcher) : Oxford Radiocarbon Accelerator Unit. Dr William Davies (Collaborating Research investigator/Archaeologist) : University of Southampton. Dr Marta Camps (Palaeolithic archaeologist) : The George Washington University, US. Dr Fiona Brock (Chemist) : Oxford Radiocarbon Accelerator Unit. 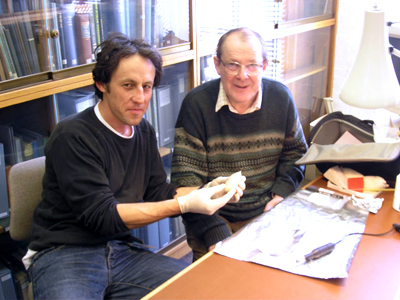 Tom Higham and Roger Jacobi resampling the ivory pendant from the site of Goat's Hole, Paviland, in 2006. The material associated with the famous "Red Lady of Paviland" skeleton is housed in the Oxford Museum of Natural History and has been redated as part of this NERC-funded programme, along with samples of bone from the skeleton itself. Sadly, the pendant yielded no dateable collagen. The skeletal remains did, and the results are to be published shortly in the Journal of Human Evolution. Ms Rachel Wood (RLAHA) : D. Phil student (Keble college). Topic: AMS dating the Mid-Upper Palaeolithic Transition in the Iberian peninsula. Ms Katerina Douka (RLAHA) : D. Phil student (Keble college). Topic: Developing new methods for dating shell carbonates and the dispersal of AMH along the Mediterranean rim.